Mosquitos and other biting insects are just a part of Summer. Some years are better than others. Depending on the amount of rain the number of mosquitos buzzing around ranges from annoying to intolerable, especially for those of us who seem to be tastier to these pests than the average Joe. N,N-Diethyl-meta-toluamide or DEET is the ingredient of choice for many mosquito repellent products. DEET was developed by the US Army for use in jungle warfare in WWII. Its effectiveness in repelling mosquito is undisputed. However, as DEET also blocks the activities of acetylcholinesterase (an enzyme which is involved in muscle activities), it can have adverse health effects with prolong exposure. Besides, anything which can dissolve some plastics, rayon, spandex, other synthetic fabrics can’t be all that good for the body. This was one of the reasons why we were excited to check out the ThermaCELL…it does not use DEET as the repellent. Instead, the active ingredient is an EPA approved synthetic copy of a substance found in chrysanthemum flowers. 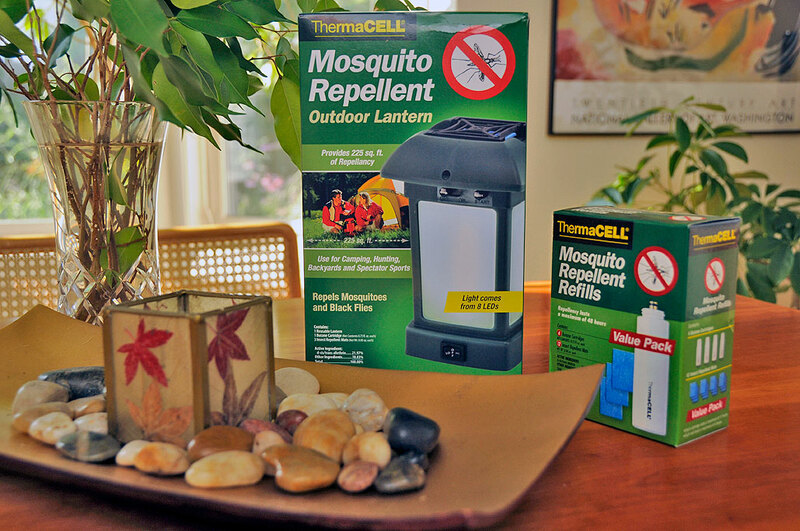 ThermaCELL claims it to be up to 98% effective against mosquitoes, black flies, and no-see-ums. ThermaCELL is an outdoor lantern with a built-in bug repelling mechanism. 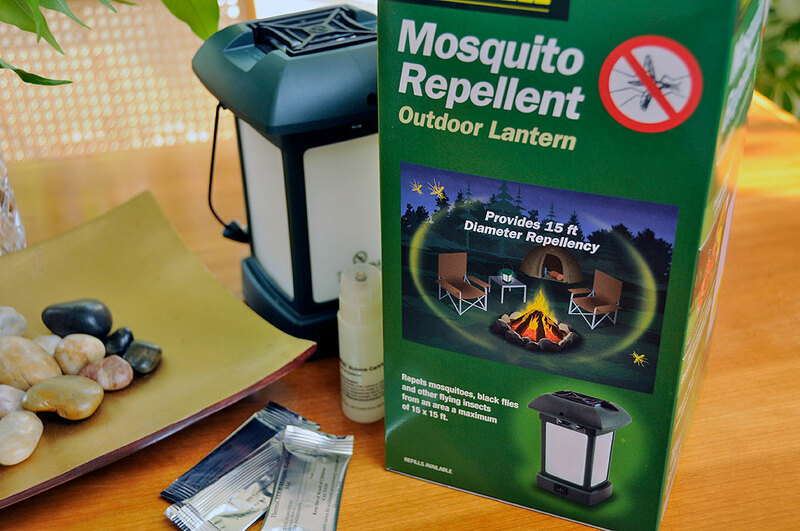 The mechanism of action is still chemical, but it is accomplished by heating a repellent-infused mat to release the repellent into the air, forming a 15’x15′ “bug shield.” A non-refillable proprietary butane cartridge is used to power the heating element. The light of the lantern is not from burning the butane, but from the battery-powered LEDs. The ThermaCELL lantern is made of plastic, is very light weight, and highly portable. As there is no glass component (LED bulbs, plastic translucent side panels) it will easily survive a drop with no damage. The top of the lantern has a slot of the heating element and the repellent mat. The control knobs for both the heating element and the light are on the side. Opening the lantern to install the butane cartridge was easy enough: remove the panel at the base, pinch the tabs on the side to release the cover from the frame, slide the cover from the frame. No tools needed. The cartridge may then be screwed into the threaded receptical inside the lantern. Once the cartridge has been securely inserted, slide the unit back together and the thing is good to go. The ThermaCELL lantern comes with one butane cartridge and three repellent mats. Each cartridge is rated for 12 hours and each mat is active for four hours. The refill pack comes with four cartridges and twelve mats, which should pretty much last an entire month or one mosquito-infested weekend. We will first test it out in the RainyDayGarden. If it works as advertised, then we’ll take it out to some more challenging areas to see how it performs. Will have the FirstUse posted next week and the InTheWild update at the end of the month. While it may be a bit late in the season for looking at bug repellents, but hey…we are pretty sure there will still be mosquitos next year.